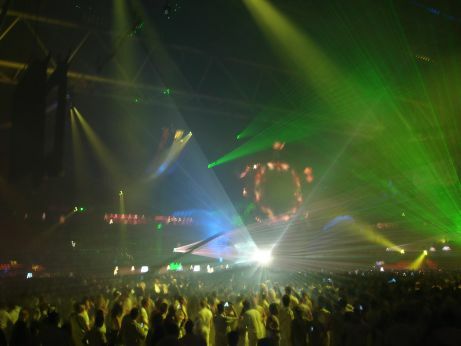 Over the years, Sensation has steadily grown to become one of the world's most anticipated dance events. 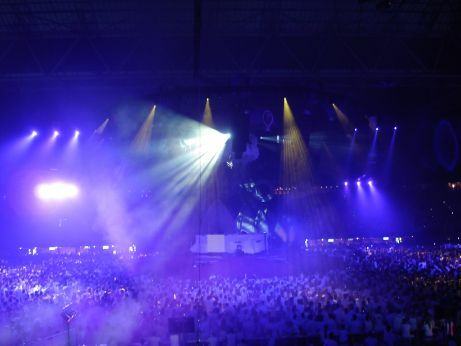 People from all over the globe fly over to Holland to enjoy a night filled with music, entertainment and acts in a football stadium that can hold up to 50.000 souls. While the show was to begin no earlier than ~22:45, ID&T decided to already open the doors of the ArenA around nine o'clock. This seems to have been a good move, because a great amount of people was already present when yours truly entered the venue around ten. Daylight was still shining through the stadium's roof, giving the viewer a very clear picture of what was going on on the field. The first sights of tens of thousands of people in white are very, very impressive I must say. While there was no music yet (just some teasing ambient loop playing over and over again), everyone kept on cheering and cheering while being entertained by green guys rolling around the field in plastic balls. This was actually part of the theme, more of that later! As nothing was happening yet musical-wise, we had some time to get a very clear picture of what the stage looked like and guess around a bit about the theme. From a broad perspective, the whole thing reminded of a fairytale. Two huge screens with a countdown clock projected on them were located on both sides of the field, and right in the middle was of course the vastly impressive stage and DJ booth. The main element consisted of a massive round stained glass type of thing, which looked like it was taken from a cathedral in some way. In the middle, there was another big projection screen which showed live streams from the DJ booth, intermezzo movies in between DJ's and loads more nice stuff to keep the mind entertained. Mysterious eyes surrounded the DJ booth, spinning around to ensure a very eerie, mystical vibe to come forward. Above all this was this huge certain kind of thing that went up and down all the time during the night. After a five-minute countdown, the whole thing finally started. And what a start it was! A green-haired guy calling himself 'The Sandman' was the host for the night, with his minions being weird green puppets who were constantly in search of someone to catch dreams from. This is exactly what was repeated throughout the event: every introduction of a new jock consisted of the search for a (seemingly random) party attendee. As a show element, a transparant round device was put on the heads of the randomly chosen persons to 'catch their dreams'. The coolest thing about this was that short movies were displayed, showing the contents of the dreams. Ranging from excessive drinking to orgie-like scenes, this was definitely very interesting to look at! Roog, Erick E and their MC Gee form HouseQuake, a housey trio serving as a perfect start for the night. Their housey tracks with a true summer vibe definititely kept the crowd going! Steve Angello's massive new single 'Teasing Mr. Charlie' tore up the floor in no-time, as did a beefy remix of Basement Jaxx's 'Where's Your Head At' and of course one of thé hits of the moment, FLG - 'Put Your Hands Up For Detroit'. MC Gee actually did a very nice job; normally, I'm not that fond of MC's, but this guy just did everything right. A very nice addition to the set. The daylight already faded away, so the first glimpses of the massive lighting arrays started to become visible. Full capacity wasn't reached during the beginning of the night, but it sure looked nice already. After Roog and Erick E's wicked set, it was time for one of the biggest surprises of the night. Suddenly, the face of Maxi Jazz (Faithless' vocalist) appeared on all the screens. He started telling about Dance4Life, an organisation that fights HIV and aids by uniting people who love dance music on parties around the world. The ambassador for this organisation is Tiësto, who, as a surprise, played a 35 minute set! Judging from the tracks he played, his set was a bit of a let-down. 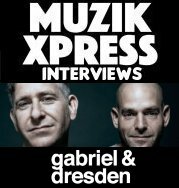 He played his remix for Kane's 'Rain Down On Me', as well as a new remix of 'Lethal Industry' and a tune from his ISOS5 album, 'Moonlight Party' by Fonzerelli. It did fit the crowd really well though, as everyone was going nuts completely! 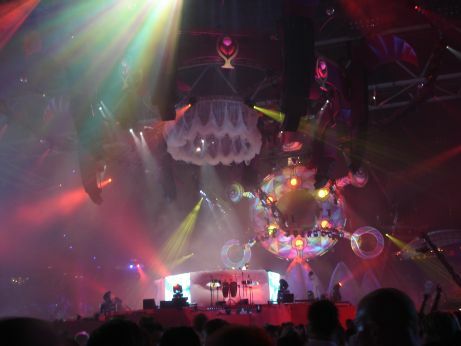 As the cherry on the cake, Tiësto played a brand new production coming from his hands, being the Dance4Life Anthem featuring vocals from Maxi Jazz. A sidenote must be made about the crowd. I've never seen a crowd as diverse as the one on this event! 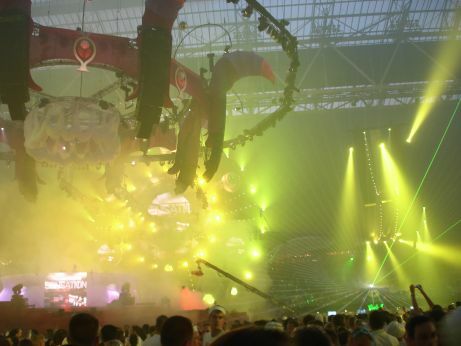 People of every size, width and age were present, showing that Sensation is one of the most well-known, mainstream events of the present day. Most party people were friendly though, and the amount of beautiful women was quite amazing. The main area had four large bars located in every corner of it to ensure a steady flow of liquids. I haven't waited for more than two minutes for my drinks, so a big plus goes to the catering facilities. There was also enough variety in food, ranging from fruit salads to hamburgers to French fries. The payment method was a bit odd though: no coins like on other parties, but instead a pass which could be bought for 10, 20 or 50 euro's. It didn't cause me any kind of trouble; in stead, it's quite handy! No hassling around with dozens of coins in your pocket (which are lost easily), just one card to buy everything you need. 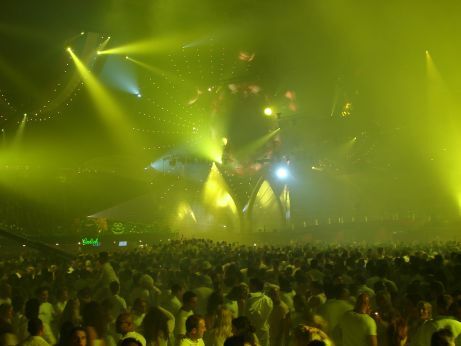 After Tiësto's performance, our green-haired host returned for something totally unexpected, yet very well thought out. As the next DJ, David Guetta (who plays house mostly) would have a hard time adjusting to Tiësto's trancy sound, the organisation decided to do things the other way around and throw in a massive intermezzo filled with a band playing a mean, raw cover of the Beastie Boys' 'You Gotta Fight For Your Right' (yeah, a rock song!). 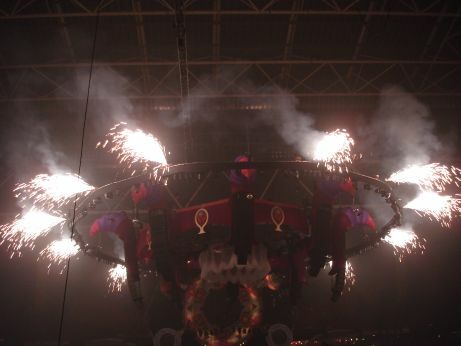 Flames ignited from all over the Arena, and all the lighting turned red to bring forward a very wicked, devilish vibe. David Guetta started off with his bootleg of 'Love Don't Walk Away'. Overall, his set consisted of a let of acapella's, bootlegs of old tunes like Sun's 'Without Love' and even some classics like Faithless' 'Insomnia' (in a new remix) and 'Meet Her At The Loveparade'. I couldn't really get into his set, so I went to sit down and rest a bit to be back in time for the Megamix. 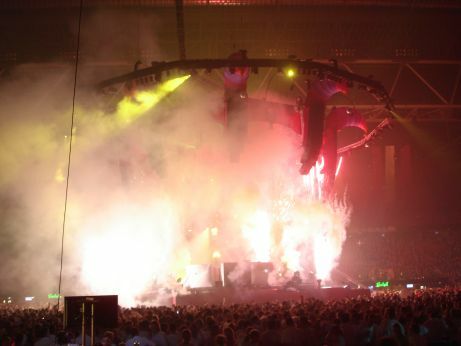 Right from the first edition of Sensation, the Megamix has been half an hour full of spectacle. This edition was definitely no exception! Fireworks ignited all over the place, flames burst out of the DJ booth... wonderful to see. All the biggest house-hits of the moment were thrown in an amazingly rapid mix, which made the crowd go wild perhaps even more than during Tiësto's set. A wagonload of superb lasers cut themselves through the air, even more fireworks went up, it was crazy! 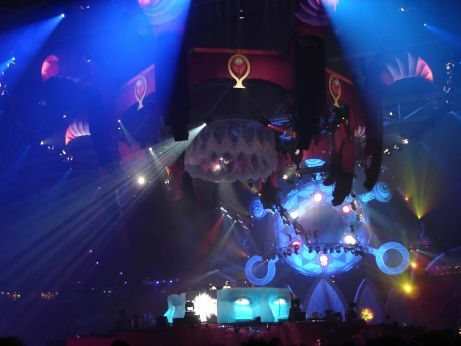 The biggest hype moment appeared when this year's anthem by Sander Kleinenberg called 'This Is Sensation' was played. The place blew up! During and in between the sets, lots and lots of cool visual entertainment was visible right on stage. Professional dancers, acrobatic artists, and even people riding on flying horses were all doing their thing. Live percussion was being played during Roog & Erick E's set, all making the event an even more impressive experience. After the Megamix, Swedish House Mafia resident Steve Angello took over the wheels of steel to let the crowd feel his typical style. Somehow, it looked like everyone was getting tired. 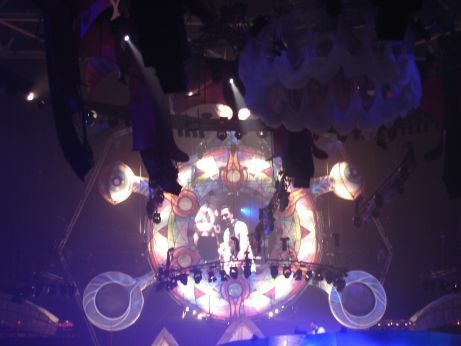 The party vibe was still there, but it was a lot less present compared with the performances of Tiësto and the Megamix. Steve mixed together a selection of the best tunes from himself and his Swedish friends, including Buy Now - 'For Sale', a massive remix of Pryda's 'Aftermath', his own 'Teasing Mr. Charlie' (yes, again!) and a remix of the always returning 'Sweet Dreams', which naturally went down a storm. Apart from these floorfillers, his set seemed just a bit too deep for the Sensation crowd. Up next was Sander Kleinenberg, the man who made this year's Sensation White Anthem. It's actually just an edit of one his most recent tunes called 'This Is Not Miami', but that doesn't take away that it's a massive, massive party tune!! Even bigger and better bits of fireworks exploded in the air like it was New Year's Day during the climax of the tune, and with it's beefy, catchy bassline it must have created an earthquake of 2,0 on Richter's scale with all them people jumping up and down. Another wonderful thing about Sander's set was the fact that he wasn't just the DJ, but also the one who took care of the visuals using DVD's. These were definitely the best visuals I have ever seen: every tune had a unique sequence of video's coming with them, perfectly fitting in with the structure to create an astonishingly great visual effect. I think Sander is one of the first DVDJ's, and it's definitely groundbreaking! To complete his set, he introduced us to wicked remixes of tunes by Fatboy Slim, Underworld and The Prodigy. 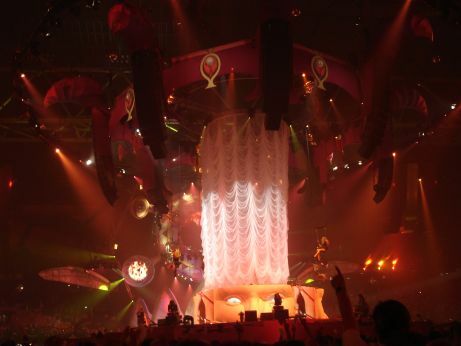 While most of this edition of Sensation consisted of house DJ's because of the massive rise of the house scene in Holland over the past year, there was still time for some proper trance (next to Tiësto's set). Ferry Corsten only had 45 minutes to do his thing, but boy did he do well! He played only own productions, all tunes from his massive new album L.E.F. (which is also reviewed here on i:Vibes). 'Are You Ready', 'Fire', his remix for the Prison Break theme song, 'Cubikated', 'Watch Out', 'Beautiful', 'L.E.F. ', he played them all! Ferry's set also included the most memorable moment of the night. Well, in my opinion that is. During the breakdown of 'Galaxia', four people with violins started playing a fantastic classical interlude, which smoothly flowed into the beautiful main sequence of Galaxia's melodies. The crowd just stood there, amazed by the beauty of this intermezzo... truly amazing. The visuals were also completely aligned with the L.E.F. album concept. It's a shame that Ferry's album launch party was cancelled at the last moment back in May, because if he had played a set like this it would have been a gorgeous night. In the meantime, daylight returned to the Arena. Benny Rodrigues geared up to close this edition of Sensation White with a bang! Known for his combination of house and techno in his set, Benny spun a raw, harsh set filled with deep, bassy tunes and wicked minimal house tracks, combined with infectious vocal tunes to top things off. I don't know any of the tracks he played, but it surely served as a nice closer. Our thanks fly out to Laura at ID&T for making things possible.